Excellent turn out for the Richard Elliott Three Loops. Since I joined the Wheelers in 2005 I cannot remember so many riders tackling either the full Three Loops or Two Loops: 10 and 9 respectively, a great indicator of the health of the club of which Richard Elliott was the chair from 1996 to 1998. All riders have my considerable respect. Both distances are very tough rides. For me, my first attempt at Two Loops (having done Three at least 13 times) turned out to be my worst day on a bike since my first, under-nutritioned, club run to Grindleford in 2006, constantly losing the wheel in front of me after the first cafe stop at 37 miles and absolutely crawling round the remaining 60 miles, devoid of any energy at all, to get home to my usual hero’s welcome (‘you’ve done too much’) after 5.00 pm. I even looked behind me as I staggered up Pexhill wondering if I was going to be lapped by the Masters of The Three Loops. Many thanks to Nigel for towing me home after we split from the Three Loopers at 65 miles. 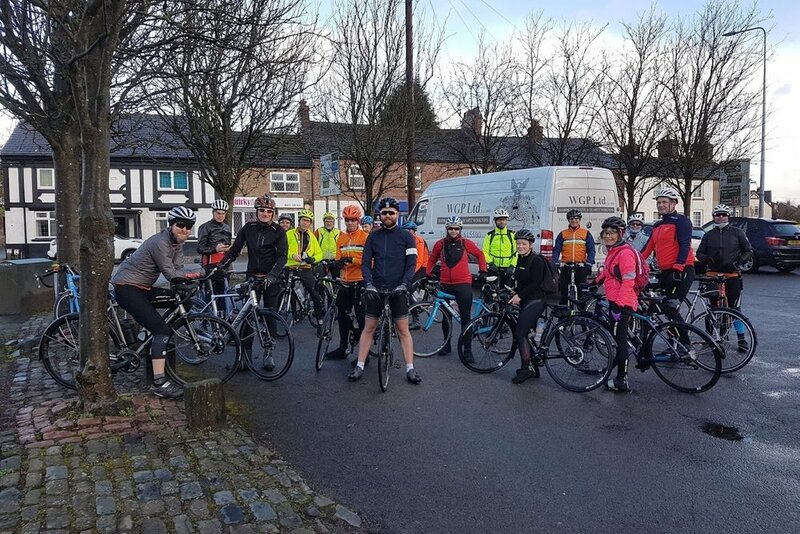 Thanks to Darren for organising and leading and to Paul for tweaking the routes: good to see so many Larkling riders conquering the Two Loops, newly extended to make 100 miles: well done all. 8.00 am Sunday morning. L to R: Paul (3), Darren (3), Nigel (2), Bennet (3), Eddie (3), Fred (3), Christian (3), Richard (3), Christian (3), Dave (2), Mark (2), Simon (3), Kirsten (2), Phil (2), Sue (2), Alison (2), Rob (2) Simon (3).